Put yourself on a New York City streetcorner on a summer afternoon in 1929. You can imagine it, sure, but can you really hear it? No? Emma Thompson, a MacArthur-winning professor of history at Princeton University, has constructed a digital time machine that allows you to experience the jack hammers, fog horns and splashing fire hydrants of New York’s yesteryear in a web site called The Roaring Twenties. The way the sound specialist did this is ingenious. She paired actual noise complaints from the files of New York City’s Health Department with a detailed block-by-block Google Map. It’s a digital interface that covers all five boroughs of the city in the years 1926 to 1933. You can click on one of 600 pins and call up an image of the original complaint – plenty of complaints about noise, then as now – and the official response, if any. N. Schmuck of Greenpoint, Brooklyn, for example, was being driven nuts by factory noise from the nearby Colonial Pickle Works. Another complainant, attorney H. Bartow Farr, said his sleep had been disrupted by a racket on the East River — nighttime dredging close by his Gracie Square home. One function on the site allows you to search by type of complaint, so you can find out exactly how many foghorn complaints registered in a certain time frame. You might not have thought you wanted to know about foghorn complaints with this degree of specificity, but I think you’ll be surprised. 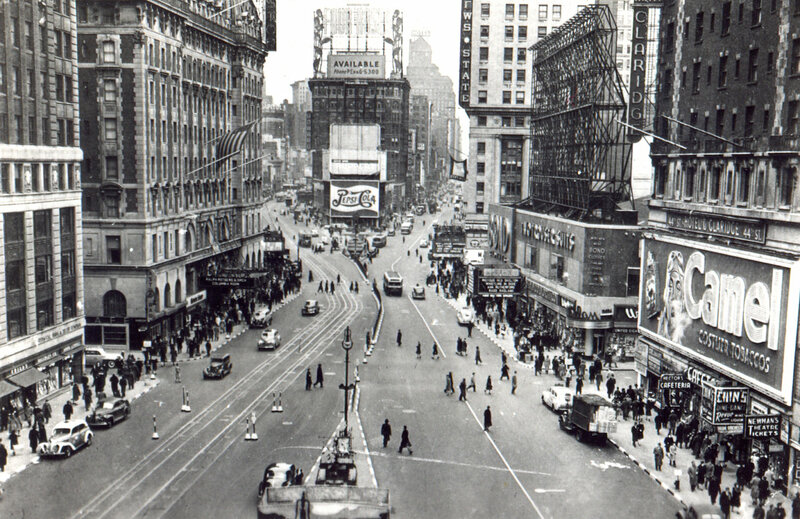 “My first impression of New York was its noise,” said a Japanese governor visiting the city in 1920, cited in The New York Times. As an aural historian, Thompson believes that it’s important to understand the context of sound, its meaning as well as the sound itself. 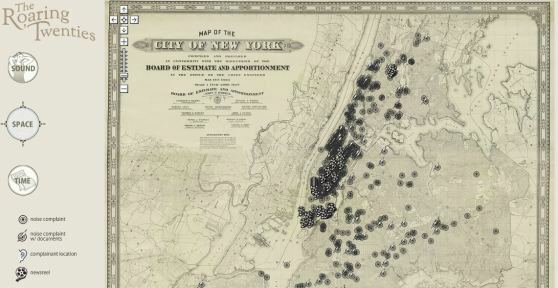 And that is why this fascinating project incorporates not only paper evidence, the complaints, the maps, but the actual noises of New York themselves, unmediated. How to capture those radios blaring in the street? Well, sound cinema was just then taking off. Thompson and web designer Scott Mahoy assembled images sourced from Fox MovieTone newsreel footage, pictures that once filmed were often left on the cutting room floor. The technology was still crude, but watching a snippet is amazing. Select one newsreel icon on the Roaring Twenties map and you find yourself in the hubbub of Times Square, cruising among the grand marquees. Another takes you to Central Park and the cheeky frolic of a crowd of kids shooting marbles. Or go visit with a ukelele strummer on the beach at Coney Island one hot day in 1930. 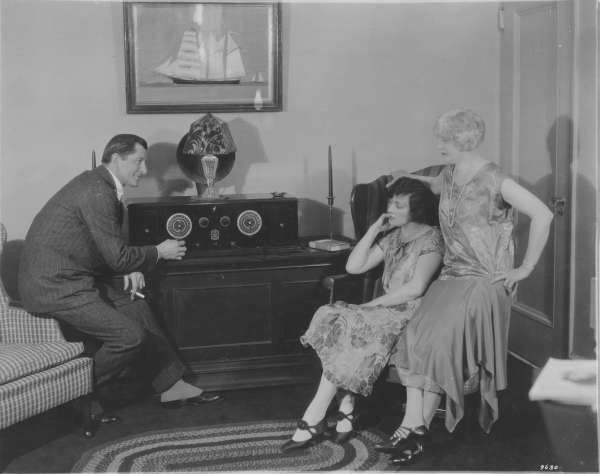 The newsreels are not matched precisely to the noise complaints, but close enough. It’s sound-around. For a taste, listen to the NPR segment about the project. I swear, The Roaring Twenties is as close as you’ll get to Fitzgerald-era New York. (I only wish such a vehicle existed for the 1870s when I was getting into the head of Savage Girl.) The only thing that’s missing is the ripe smell of horse manure and hot dog stands. Those will have to wait for a new generation of smell engineers, but this web treasure will help in the meantime. Maybe someone will do one on the SMELLS of New York, such as bumpiss. Hahaha… I like the NPR snippet about the street peddler known as *Ol’ Clo* who buys used clothes; he barters with a woman who wants $6.00 for her husband’s old suit. “Seventy-five cents,” he offers. Nonono. Good suit! “Ninety cents!” Nonono. “One dollar, five cents!” Sold.